After pruning wounds emerge at the site of cutting. Wounds to a diameter of 2 centimetres heal themselves and do not need additional protection. Bigger wounds tree will not be able to overgrow and are places for infections with diseases. 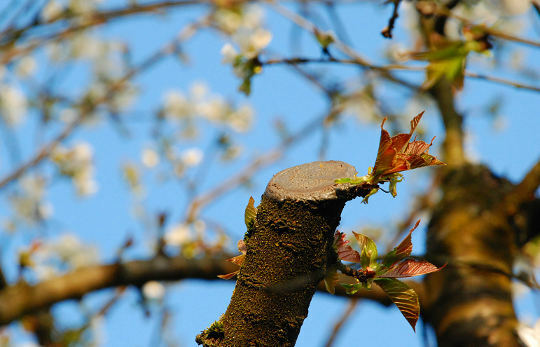 On wounds may fall spores of various fungi, which penetrate into the wood and can destroy the tree. Therefore, larger wounds should be protected. By apricots and peaches all wounds must be protected. The edge of the wound should be smoothed with garden knife. The wound should be coated with the aid of a brush or a paddle with a protective coating. There are various preparations on the market. Some contain fungicides to prevent development of fungi.